Want to avoid lippage? Yes, I’m talking about the much dreaded “L – Word”. A word that is rarely spoken of or given much thought, until issues arise – of course. A simple, innocuous comment during a final walkthrough, could land you in punchlist purgatory – with no way to get out. Well, I’m here to help. I’ll share with you my Top 5 tips to minimize lippage – from early design to final closeout. Now…before we jump in, what is lippage? I mean, we know what lippage is, but how is it defined in a technical sense? The definition is actually quite lucid, and straightforward. It is simply, the vertical displacement between two adjacent tiles – that’s it. However, defining it, and understanding it, are two very different things. Let’s continue. Tile lippage can be the result of a singular factor, or the combination of many factors. We’ll get down to the details shortly, but lippage isn’t about eliminating or controlling one aspect of the system. From early design, to installation practices, to understanding the inherent physical characteristics of tile – are all prerequisites to fully understanding lippage. On the topic of physical characteristics, lets touch on this briefly. Tile, by the very nature of the way it is produced, has an inherent crown in the middle. This is its highest point, when laid down flat. The curvature of the tile, which can be concave or convex, is a natural characteristic, and should be expected with all “kiln fired” clay products. This is attributable to the changes that occur during the firing and cooling process of production. We’ll talk about this in greater detail as we continue, but this is very important to know as you specify on your next project. 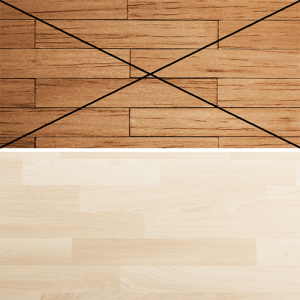 Floor prep is not voluntary – it’s mandatory. This could be, arguably – the most important step in the installation. An uneven substrate or subfloor directly telepaths to an uneven floor finish, which directly results to areas of unwanted lippage. Chipping and grinding out high points, and filling and leveling out low points is just as important as the final installation. For filling in low points, cementitious self-leveling agents or patching compounds help to smooth, flatten, and level out the substrate. Remember, any tile larger than 15” on any one side, requires a substrate flatness to vary no more than 1/8” in 10’-0”. 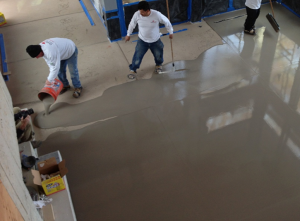 Proper floor prep is the foundation to any successful installation, and should not be overlooked. Believe it or not, there really is a science to properly specifying the joint size. It can get a little confusing, and once offset patterns are introduced, you’ll need to dust off that graphing calculator from college to make sense of it all. Good news, I’ve simplified matters. Let’s take a standard 12” x 24” pressed porcelain floor tile. Within the same carton, individual pieces can vary up to a maximum 1/16” in size. Take this maximum variance, and multiply by 3. That is the size of your grout joint. In this example, it is 3/16”. This is important, because forcing a smaller grout joint beyond the dimensional tolerance, will only result in uneven spacing, and ultimately lead to lippage. Always remember, tile manufacturers have their own internal standards, so always follow their guidance and recommendations, as they are the best resource. Lippage control systems are exactly as they sound. As tiles increase in size and facial surface, so does the potential for lippage. These mechanical leveling systems serve as both grout spacers, and leveling clips. Traditional grout spacers fall short, because they are not used to “true” or “level” adjacent tiles, they merely provide consistent joint spacing. Consider specifying lippage control systems for large format, thin-gauged, and plank-style tiles. I touched on this a little earlier. Tiles are manufactured products, composed of clays, feldspar, sand, and other natural elements. An inherent characteristic of “fired” ceramic products, is the natural crown that is present near the center of the tile. Naturally, the tile curves down towards the edges and the corners. This is why ceramic tiles are not perfectly flat. The most sophisticated manufacturing processes and the strictest of quality control measures still cannot yield a perfectly flat tile. It is with this understanding, that proper offsets can be specified. 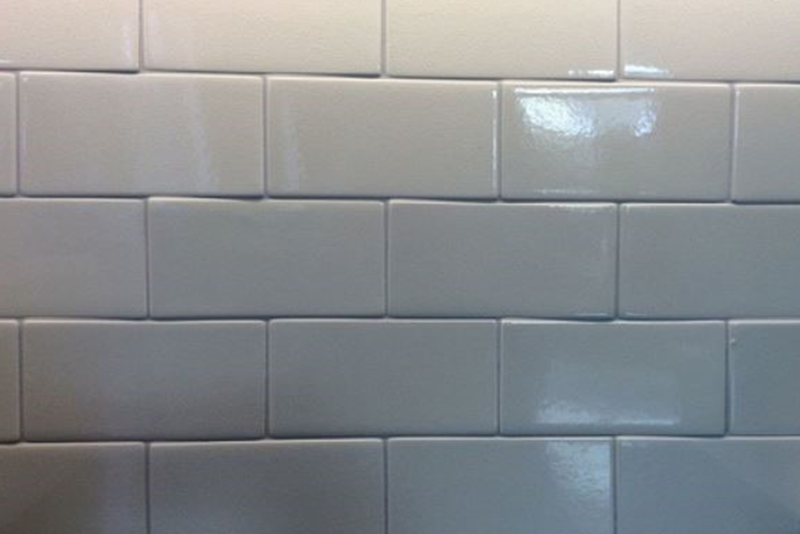 Any tile larger than 18” on any one side, cannot be offset more than 33%. Any higher percentage will directly result in lippage issues. Why? Because you are essentially marrying the lowest part of one tile, to the highest part of the adjacent tile. In addition, the use of offsets require that the grout joints are opened up slightly, to further hide the elevational differences. 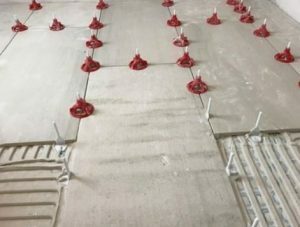 Personally speaking, I have seen and visited countless projects, where workmanship was of the highest quality, but do to the inherent flaws in the design scheme, the floors didn’t have a fighting chance. This allows for a more detailed and comprehensive warranty of the entire floor system. In addition to proper specs and appropriate labor, lippage is also affected by proper setting materials. For instance, a large and heavy floor tile must be installed using large and heavy floor tile mortar. Using mortar not specifically designed for this application, risks compromising the structural integrity of the setting bed, and possibly the curing process. Inconsistent curing is one of the major culprits in shrinkage and a major contributor to lippage. Stick to single sourcing, as this will confirm appropriateness of materials through the manufacturer, and they can provide proper guidance of their unique and proprietary products. In most cases, the standard performance warranty is extended to greater lengths, all because the system is through a single manufacturer. No one wants lippage. Not only are the aesthetics undesired, but excessive lippage can actually lead to performance issues. It is not uncommon to find damage at edges and corners when objects slide and bump up against these areas. In addition, trip-and-fall incidents are always greater with an uneven floor finish. 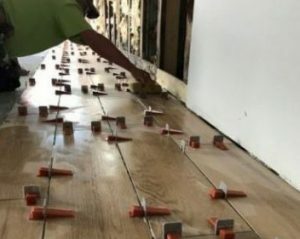 As mentioned earlier, tile lippage is typically a combination of inadequate substrate prep, inferior installation techniques, and improper material and design specs. Believe it or not, the best way to combat lippage, is actually during the design phase. Taking a proactive and thoughtful approach in building a detailed and appropriate tile specification, will help to eliminate many unwanted surprises. This degree of control allows the specifier to better drive the desired results with increased assurance and clear direction. Contact any member of CMC’s QA&T Team, as we offer complementary specification review, and can help develop your next 3-part spec.